When cold steam pipes are heated up huge amounts of condensate are generated and must be drained from the pipes. It is important that steam traps are designed to handle start-up loads. The diagram and table below can be used to roughly estimate the load of warm-up condensate generated when a steam system is heated up. Engineering ToolBox, (2003). Generation of Condensate in Cold Steam Pipes - SI Units. 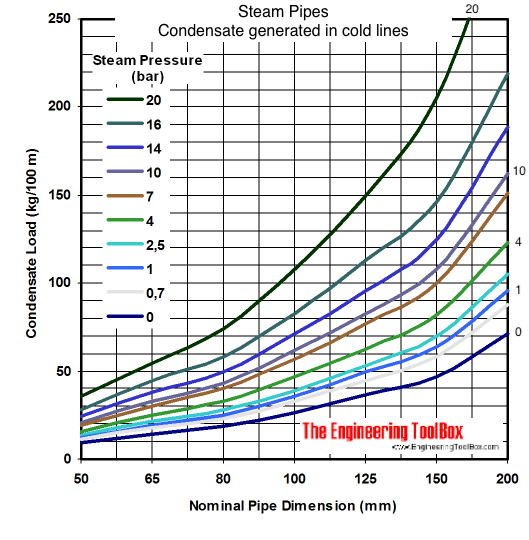 [online] Available at: https://www.engineeringtoolbox.com/condensate-load-cold-pipes-d_254.html [Accessed Day Mo. Year].